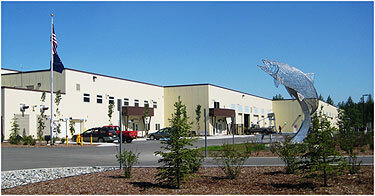 Construction of the William Jack Hernandez Sport fish Hatchery was completed in June of 2011. Located in Anchorage at the intersection of Reeve Blvd. and Post Road, this fully enclosed, recirculating aquaculture system (RAS) based facility uses the best available technology to conserve water and reduce heating demand for the production of Chinook and coho salmon, rainbow trout, and Arctic char. With over 100 rearing tanks, there is space for production of more than 6 million sport fish each year. These fingerling (1" to 2"), smolt (3" to 5") and catchable (7" to 12") fish are released throughout South Central Alaska from Cordova to Kodiak, Homer, Kenai, Seward, Anchorage, Mat/Su and Talkeetna. Sport fishing activity supported through these fish releases accounts for over $20 million a year in economic impact on local communities. To avoid stressing the fish and injuring the staff, fish are commonly pumped from one tank to another. Mid May through early October, tanker trucks are loaded with fish and hatchery staff members take turns driving them to release sites across the region. Some "stocking runs", as they are called, can take more than 24 hours. Open to the public, you are welcome to stop by from 8 am to 4 pm and take a walk through the visitor corridor. This space was set aside for public access to allow viewing of hatchery activity. Once final planning and funding are secure there will be informational and interpretive displays highlighting Division of Sport Fish activities such as Research, Management and Hatchery Production. There is a foot path outside the facility allowing access to view Ship Creek. From early July through September adult salmon can often be seen in this stretch of the creek. Returning Chinook and coho are collected and held in two raceways located creek side. 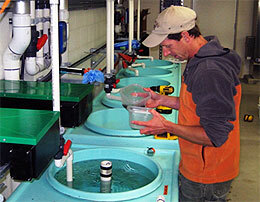 Hatchery staff will collect eggs from these fish to begin the next production cycle. Chinook salmon eggs are also collected from the Ninilchik River, Crooked Creek and Willow Creek and additional coho salmon eggs are collected at Bear Lake near Seward. Rainbow trout and Arctic char eggs come from mature adults produced inside the hatchery. Who was William Jack Hernandez? William Jack “Bill” Hernandez served his country valiantly during WWII, as a civilian contractor on Wake Island in the South Pacific, building fortifications for USMC personnel. Wake Island was attacked by the Japanese on Dec. 7, 1941, the same day as the Pearl Harbor attack, and a violent 16 day struggle ensued between the Marine regiment and an overwhelming enemy force. On December 23, 1941, Wake Island was captured and Mr. Hernandez was taken as a prisoner of war. He was a POW for three years before being released following surrender of the Japanese forces in 1945. In 1947 Mr. Hernandez enlisted in the US Army, and in 1956 his unit was transferred to Fort Richardson where he became a Fish and Wildlife Conservation NCO. His orders were to rehabilitate the lakes and streams on post. As a result of Mr. Hernandez’s efforts, in 1957 the Secretary of the Army approved a cooperative agreement between the Army, the Alaska Territorial Department of Fish and Game, and the Fort Richardson power plant, allowing the plant’s cooling pond to be used for rearing fish. Mr. Hernandez ran the fish rearing project, and annual production reached 12,000 rainbow trout, 100,000 Chinook salmon smolt, and 200,000 Coho salmon smolt. In 1968 Mr. Hernandez retired from the US Army and received an Army Commendation Medal for his efforts. Shortly after retirement, Hernandez was hired by the Alaska Department of Fish and Game as a Fish Culturist at the Fire Lake Hatchery. In a few years he returned to Fort Richardson to manage the large scale fish hatchery constructed at the cooling pond. He also worked at the nearby Elmendorf fish hatchery. 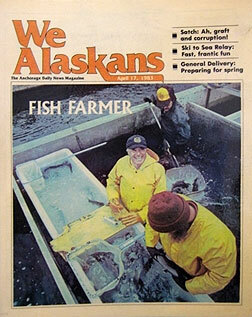 In 1983, after 26 years of dedicated service raising salmon and trout, Hernandez retired. Sadly, Hernandez died of cancer in 2003. The Veterans of Foreign Wars Post 7665 honored him with a 21-gun salute. He was the epitome of Tom Brokaw’s “Greatest Generation”. Without his drive and dedication, the fish rearing project at Fort Richardson would have never gotten off the ground. His life’s work made an enormous contribution to the sport and commercial fishing industry of the Cook Inlet region.